In the study, the sheep were rewarded when they recognized the famous faces. Though their political leanings are a little fuzzy, eight sheep at the University of Cambridge in England can now recognize Barack Obama's face. A team of Cantabrigian researchers trained eight female Welsh mountain sheep to recognize the faces of four famous people to determine how sheep measure up to monkeys and humans in the task. 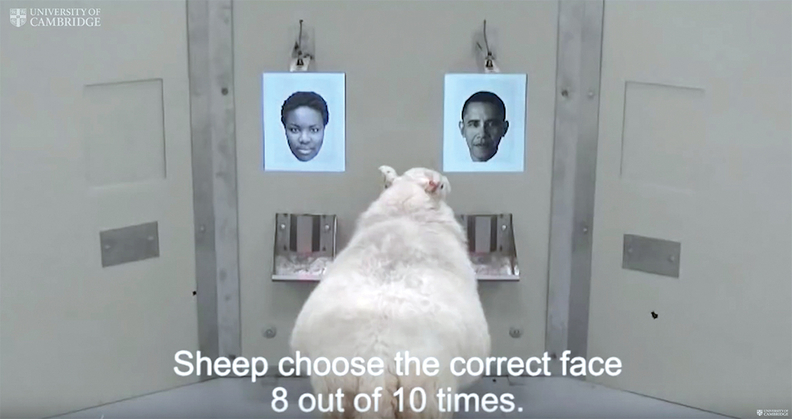 The sheep learned to select the faces of Obama, BBC newscaster Fiona Bruce, and actors Emma Watson and Jake Gyllenhaal. The animals were put through three training scenarios. In each step they were presented with two options: a photo of the celebrity facing forward, or a photo of something or someone else. They then had 15 seconds to approach the celebrity image and trigger an infrared sensor that, if they chose correctly, would pop out a treat. On average the sheep chose the celebrity face 8 out of 10 times. Anyone doubting their sheer ability is having the wool pulled over their eyes. "Sheep are capable of sophisticated decision-making," neurobiologist and study author Jenny Morton told the Washington Post. To show they're not just celebrity-worshipping sheeple, the flock was also tasked with choosing between a picture of their handler and an unfamiliar face, and they readily recognized their handlers. Being able to recognize a 2-D photo of someone they see in real life shows the ability for "complex image processing," said the authors of the study, which was published in Royal Society Open Science this month. In her research on Huntington's disease, Morton uses sheep as a stand-in for humans in part because of their large brains and humanlike anatomy. People who have Huntington's struggle to recognize facial emotions. "Although I didn't think sheep could recognize emotion, it made me think about face recognition as a complex brain process," Morton said.